(Feb. 21, 2011) — Today, we reflect and pay respect to the passing of our father, El-Hajj Malik El-Shabazz (Malcolm X). Today, we once again honor his legacy. It was on this day, February 21st, in the year of 1965 that he was martyred in New York at the place then known as The Audubon Ballroom, and now known as the "Malcolm X & Dr. Betty Shabazz Memorial and Educational Center." Malcolm X was a man of vision, integrity and courage. He was born Malcolm Little on May 19, 1925 in Omaha, Nebraska to Reverend Earl and Louise Norton-Little who instilled the compassion for injustice and leadership ideals the world came to know of our father. 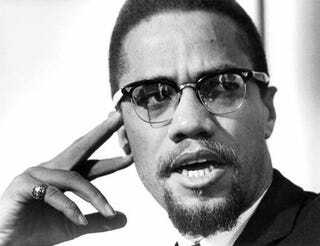 In the late 1940's he studied, later joined the Nation of Islam and took the name Malcolm X. In March 1964, he left the Nation of Islam to form the Muslim Mosque, Inc. as well as the Organization of African-American Unity. That same year, Malcolm X went on a pilgrimage to Mecca, Saudi Arabia where he expanded his message of justice and responsibility for all races. Our family remains united and spirited in our loving support and efforts to join forces with those who love Malcolm X from around the world. Despite false reports and misdeeds of those in and out of the media seeking to divide and conquer, the bond and spirit of this family and community will not be broken. Tonight, there will be a public memorial at the Center commencing at 6pm, located at 3940 Broadway in Harlem, New York. Later this week on Thursday, February 24th, 2011, we the daughters of Malcolm X will convene and participate in a press conference and later participate in a private "Call To Action" ceremony, organized on behalf of the Shabazz family, and the newly formed protection entity X Legacy, LLC. Indeed, "Malcolm X was our Black shining Prince! — who didn't hesitate to die. Because he loved us so." He loved us all and we are so grateful for the continued support and love from all people worldwide supporting Malcolm X and the X Legacy. In other news: Tragedy at Oprah Winfrey Leadership Academy.